No matter what field you are in, you are sure to speak your own “language”, using terms that lose people outside your expertise. Weaving is no different. Some weaving terms have worked their way into common idioms (Have you ever heard someone refer to “the warp and woof of life”?) but are still a little obscure. So here’s a quick little lesson to help clarify cloth-making for you! The place to start is the loom. 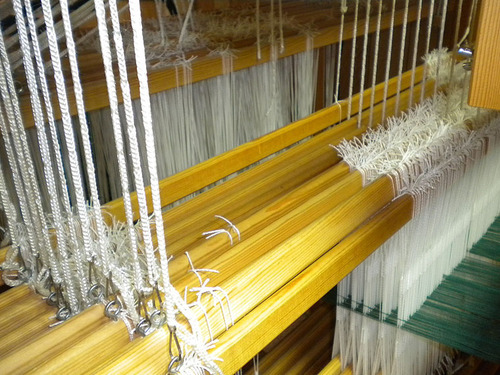 The loom is the primary tool used to create cloth. There are lots of different kinds of looms: warp-weighted looms, horizontal looms, vertical looms, Navajo looms, backstrap looms, barn looms, draw looms, dobby looms, and computer-assisted looms. To learn more about all the different kinds of looms used throughout history, check out The Book of Loomsby Eric Broudy (1979, University of New England). It is a thorough presentation of lots of different looms, even if it is an older book and doesn’t include the more recent computer-assisted looms available now. 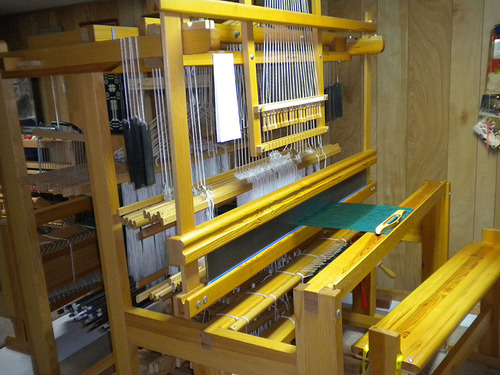 Here is the 12-harness Swedish draw loom that lives in my studio. 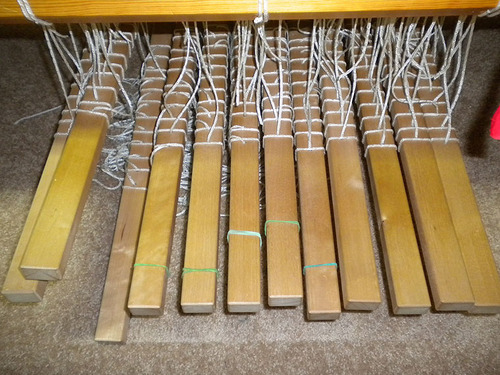 The harnesses or shafts are the frames that hang inside a floor loom and carry the heddles through which the warp is threaded. There can be anywhere from 2 to 24 or more harnesses on a loom. The more harnesses one has, the more patterning is possible. 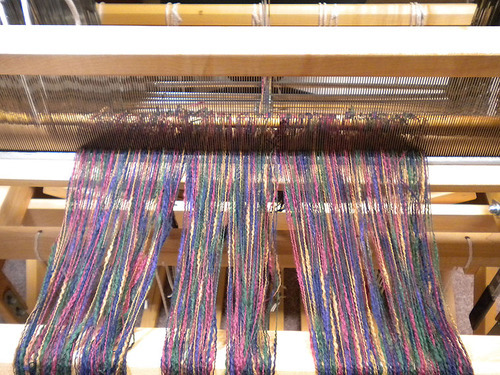 Each warp thread goes through one heddle (white string heddles here) on one shaft. The exception to this is the draw loom which has two sets of harnesses and the warp will be threaded through one shaft on each set. I know—it’s complicated. 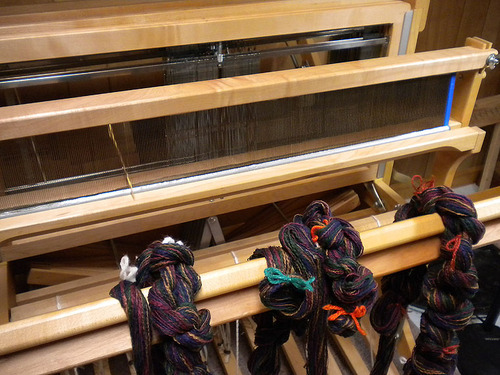 Here you can see the front harness on my draw loom with the draw harness hanging in the back. The beater holds the reed which pushes the weft thread down to make the cloth. Each warp thread is threaded through one slot or dent in the reed and then through one heddle on one of the shafts. Here you can see the reed in the beater with the warp yet to be threaded on my 8-shaft loom. The warp is the foundation of the cloth, the length-wise threads that are tied onto the loom. Here you can see the warp threaded through the reed. The treadles are tied to the harnesses and control their movement, leaving the hands free to throw the shuttle, which carries the weft across the warp. The weft is the thread that is interwoven with the warp. In some older texts, the word “woof” is used, but it is the same thing. Here you can see the weft thread wound on the bobbin in the shuttle with the weaving in progress. 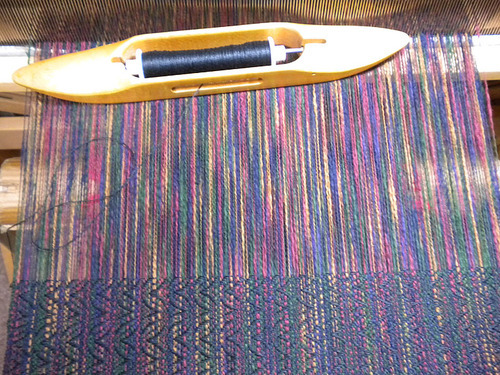 That is a quick lesson in weaving terms and a quick tour of a warp in progress. More on weaving terms in coming blogs.